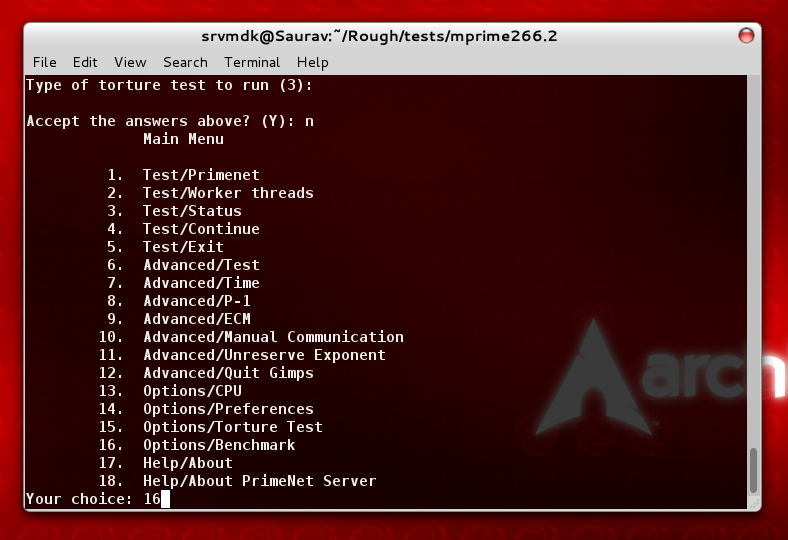 Comparing and benchmaring performance and stability of Arch Linux, Ubuntu 12.04 Long Term Support and Windows 7 32 bit OSes using mprime (Prime 95) and systester full detailed results. Well there have been much talks about this before. Linux fans always say that Linux is actually faster than Windows in all respects. Also I have heard people saying that Arch Linux is faster than other distros, but there have been little concrete proof to validate that saying. I agree that after switching to Arch from Fedora, I find apps and boot a bit faster than before but thats only basis of my sense, no figures attached. To find out if its really faster, I conducted a series of tests on Windows 7, Arch Linux and Ubuntu 12.04 LTS all 32 bit OSes. 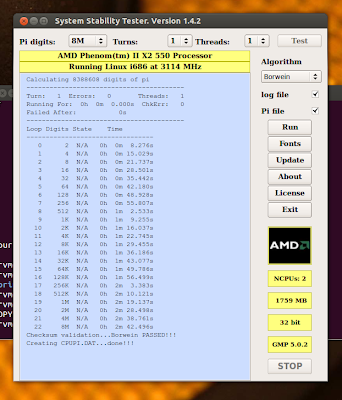 Phoronix conducted a similar test before but that was in days of Linux 2.x series kernel and Gnome desktop. Linux has gone through a major change since then, and its time that we benchmark them again.So not wasting my time in much talks, here’s my specks. 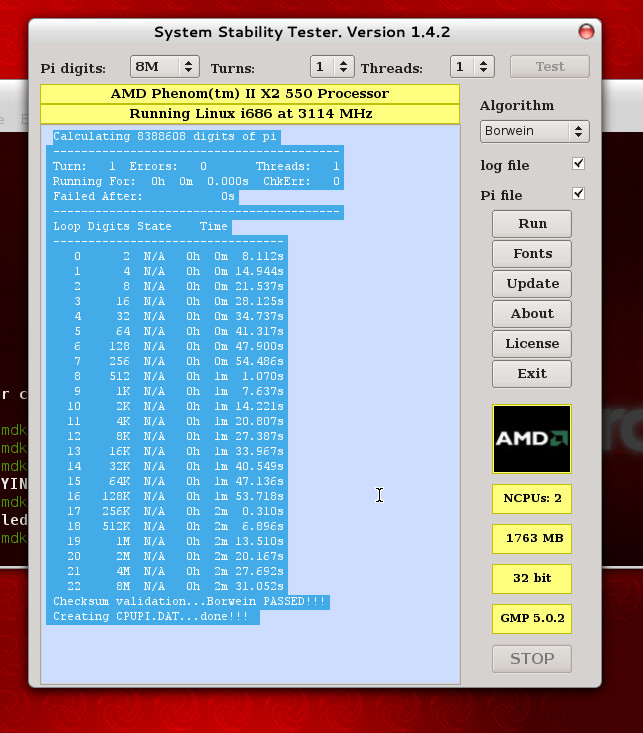 I have a dual core AMD Phenom II x2 550 Black Edition Processor. With the help of its core unlocker, I can overclock it to use four cores than two. However, for this test I used two cores only as I am not sure how the different OSes take the core unlocker (though that shouldn’t be much dependent on OS). I have a 2 GB DDR3 RAM and 500 GB disk space (does it matter?). For the test, I am using Ubuntu 12.04 which has linux-3.2.0.24 kernel and gnome 3.4 desktop along with Unity. Arch has a 3.0.28.1-lts (long term support) kernel and gnome-shell 3.4. Both these system are full up to date while Windows 7, I care not to update. For the test, I have used two suites. The main difficulty was choosing the software thats portable across all three systems so that results cant be baised. After an hour searching the net, I found this two. One is mprime which is the famous program that is used to calculate world’s largest prime numbers since 1996 and other is systester (or System Stability Tester) a small project that calculates your system’s performance and stability by calculating millions of digits of Pi. There are more extensive programs and tools that can help you benchmarking your system (including converting a video file using ffmpeg, encoding an audio etc) but I choose just these two for the simplicity. Both of this are open source software, the later licensed under GPL while the former has some restrictions in distribution. Also they are distributed in simple binary format, directly executable in terminal, which means you don’t need to compile or install a hell of dependencies to run them. If you wish to also benchmark your PC, make sure you have some sort of software to monitor the temperature of CPU and Motherboard (like lm_sensors in Arch). Benchmarking puts your PC in rigorous tests and if temperature rises to a critical state, it may harm the hardware of your PC or render them unusable. So without much talks, lets go straight to the results. For the system stabilty tester, I didnt find any way I can log the results, so here is a screenshot of it. As seen, Arch takes 2 minutes 31 seconds to calculate 8 million digits of Pi. Unlike Arch thats a bleeding edge rolling release, Ubuntu focuses on highly tested packages before adding them in update repos. Still Ubuntu has latest packages like Gnome 3.4 and kernel which versions are parallel to Arch Linux. But I run the LTS kernel in my Arch Linux installation as its considered relatively more stable than original ones. I tested this on Ubuntu 12.04 which its itself a long term support release so we can expect this to be rock stable. As seen from this paste, Ubuntu takes almost 104 ms to calculate 8192K prime using two threads, which is 3 ms more than Arch. But the real difference comes to calculating 8 million digits of Pi. Here Ubuntu takes almost 11 seconds more than Arch, thats 2 minutes and 42 seconds. This depends on a lot more factors. Arch is always said to be lightweight as its built from scratch and you can select the package and install only what you need by hand. This keeps your system bloat free thus freeing your RAM to run other processes. Note I have also killed some processes like update-notifier, unity-lens-video to free things up. Also Arch uses mutter with gnome-shell while Ubuntu uses compiz with unity which might be a factor too. I killed the some processes from the task manager like my antivirus program, skype and other startup apps. 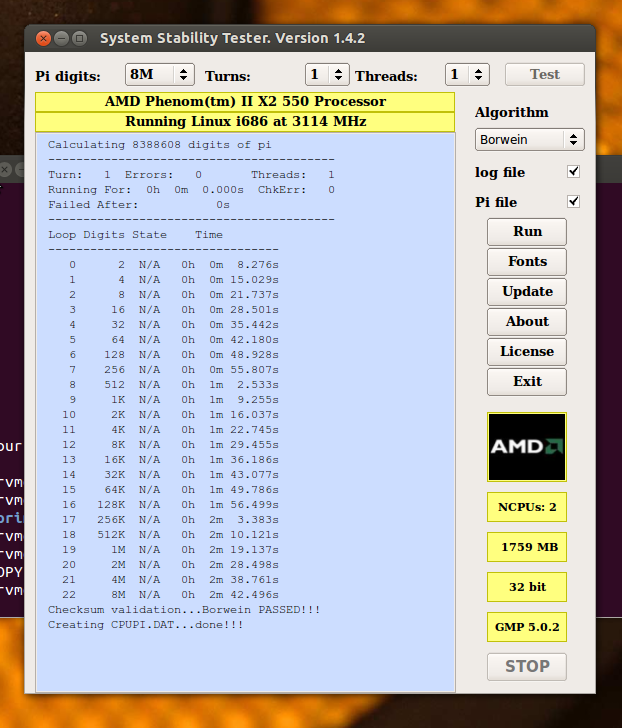 The mprime test result states that Windows 7 takes a bit above 103 ms to calculate 8192K primes using two threads, thats just a flicker less than Ubuntu. But whats more noticible is that it took 3 minutes and 31 seconds (or a minute more than Arch Linux) to calculate 8 million Pi digits. After the test, incredible happened and the program crashed for no reason and I was offered with a dialog with a link to check online for solutions which never works. So we see, Linux in general are faster than Window OSes, and lot stabler too. Also I found Arch to be hell lot faster than Ubuntu, so I can safely guess that done from scratch distros are have more performance than out-of-box ones. I wish to extend these scores with other distros and enterprise OSes like Linux Mint, Gentoo, Slackware and CentOS soon, so you can subscribe to our RSS to get future updates from this blog. Also if you wish to benchmark your favourite distribution, you can contact me personally through email. A linked question arises, does more performance mean more stability? Well, stability depends on a lot of factors, other than just performance, like packages in use, updates etc. While having an bleeding edge distro may bring stabilty in other way as it means more bugs get fixed and you get ironed packages soon, sometimes updates in Arch *do break* your system. So if you are looking for a fast, lightweight distro that you may never need to reinstall and upgrade, perfect for your home needs and tweaking, along with these awesome features, Arch will be best for you. Head over to this link for Arch Linux base install tutorial. However if you depend a lot on your PC to earn a living by using it as a workstation or a server, you may wish to use Debain, CentOS and Ubuntu also. Afterall, everyone hates your system to break when you have some critcal work pending. Disclaimer: This is an affiliate post. Learn why? How to Install Ubuntu 11.10 (11.04, 10.10) alongside Windows 7 and XP without losing data (dual boot). Is it average time? How many times you performed this test in each os? You did’nt updated win7 means it is a pirated version :p? i’ve had more problems updating official licensed win 7 than i have the pirated version. the number one myth is that microsoft has all these secret detection methods and such to catch piraters but theres only one update and all you have to do is install it before the crack and done. mse and anything else you official fan-boys think only paying customers can access is 100% free. i know this is off subject but i believe in on this planet to inform. You don’t overclock the cores you unlock them 🙂 . Also it does matter to some extent I believe whether you have 4 cores running or 2 of them .I would like to see a comparision with all 4 cores chugging along in Windows 7,Arch Linux and Ubuntu . Please,please,please . One more thing : Which version of Windows 7 were you using (Home Premium , Ultimate etc)? And was it updated to the latest version ? Ya I dint unlock them as I was not sure as how different OSes will take it. Update it . Also you must have a variety of tests and not one to conclude that Linux is faster than Windows.A variety of tests that would stress all the different aspects of the system would be better.I Would suggest you to load up blender on each OS and see how much time it takes to render the same image,fire up GIMP and apply some filters and measure how long it takes . You conclude that Linux “in general” is faster than Windows on the basis of *one* buggy program? OK, yeah pigs fly too. well the thing didnt crash in Ubuntu or arch for the matter. The comparision is not fair between ubuntu and Arch. Arch uses gcc 4.7 to build the packages and with a latest kernel, definitely arch is going to be faster. You should have used either fedora 17 with same kernel version, as ubuntu LTS doesn’t have the comparable default kernel version either. For using just the recent version of the kernel you should have used the PPAs for new kernel. The Fedora 17 and arch would have at least been more comparable.